This past weekend was so much fun, and it went by way too quick! (As always) I headed home to Laurel on Friday because the South Mississippi Fair was in town, which is probably my favorite part of October. Oh how I LOVE fair food. It’s an unhealthy obsession, I know, but I can easily justify it since the fair only comes once a year! Between oversized corn dogs and red velvet funnel cake, my high expectations were met once again. And I am still snacking on my delicious cotton candy as I type! Anne of Green Gables said it best, “I’m so glad I live in a world where there are Octobers.” Yes girl, I am too! So I told y’all that a fall two piece set would be coming to Sassy Southern Blonde very soon, and here it is! This is, hands down, my FAVORITE outfit post yet. I am obsessed with two pieces (like y’all didn’t know), so I immediately fell in love with this burgundy set. I just purchased it a week ago at Material Girls in Hattiesburg, and they still have some in stock when I went by on Saturday. YAY! For all you MSU girls, this outfit is perfect for homecoming this weekend since the game is at 2:30! I am so happy the weather is finally cooling down in South Mississippi, so throwing a long cardi over it would be perfect once the temperatures drop at night. (I’m linking an adorable one below) I paired the set with a sleek pair of OTK (over the knee) boots that are under $100 dollars. These are identical to the expensive designer version, but for way less! Shop the details below. Thanks for reading! Even though we are halfway through this week, I am still wishing I was lounging on the beach like last week! Mississippi State had fall break, so my friends and I headed to Destin on Wednesday for a few days. During the day, we enjoyed the beautiful October beach weather, and then we went to Baytowne Wharf at night for delicious food and drinks. Destin is my favorite beach to visit just because there is so much to do! Between shopping and entertainment, you will never get bored! So, I am beyond excited that ruffles are a huge trend again this season. Ruffles create such a sweet and feminine vibe that I have always loved. 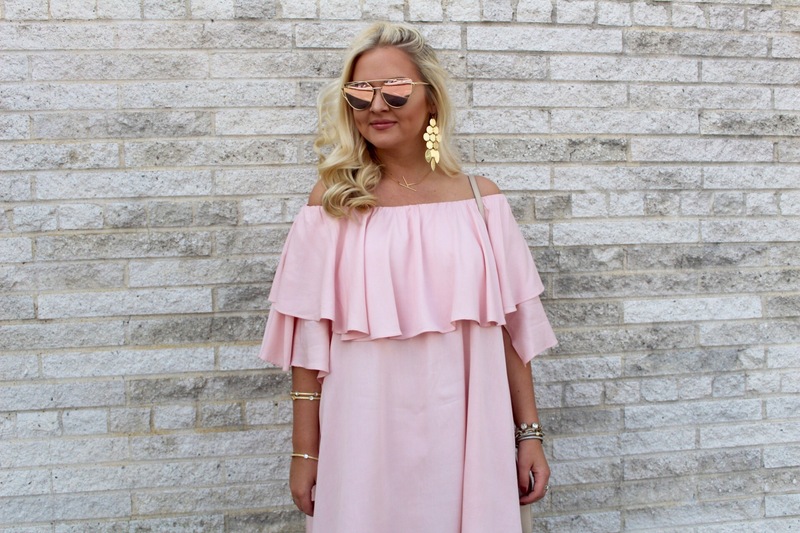 I bought this precious pale pink dress a couple months ago, but it is now sold out. I found a similar one that’s sure to turn heads, though! 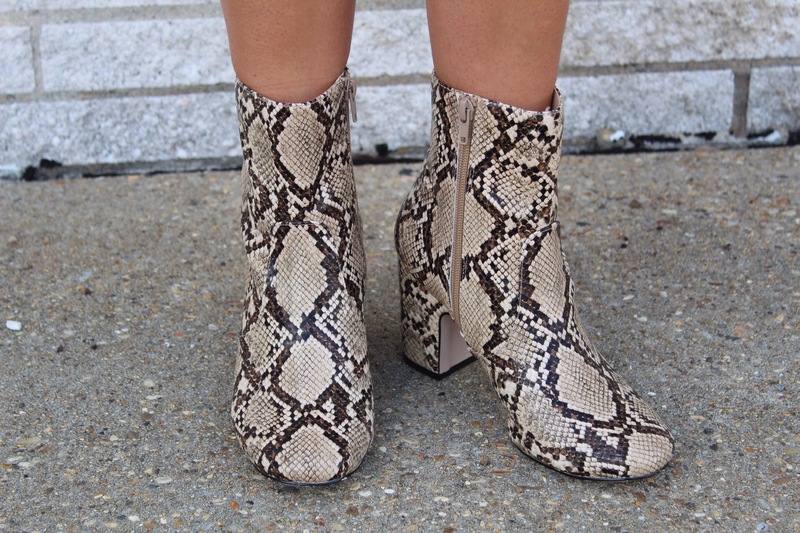 I paired the dress with these snakeskin booties I am OBSESSED with. I shared them on my Instagram (@sassysouthernblonde) a few weeks ago! And guess what? They are under $60 dollars with many sizes left in stock! Even with so many other cute fall booties, these cannot be topped. Plus, there’s no way you’d regret buying them with this great price point! With the mild temperature changes lately, I have still been enjoying my favorite summer clothes before they are packed away until next spring! I love that florals are coming back as a trend this fall because let’s be honest, half of our closets are probably floral dresses and tops. 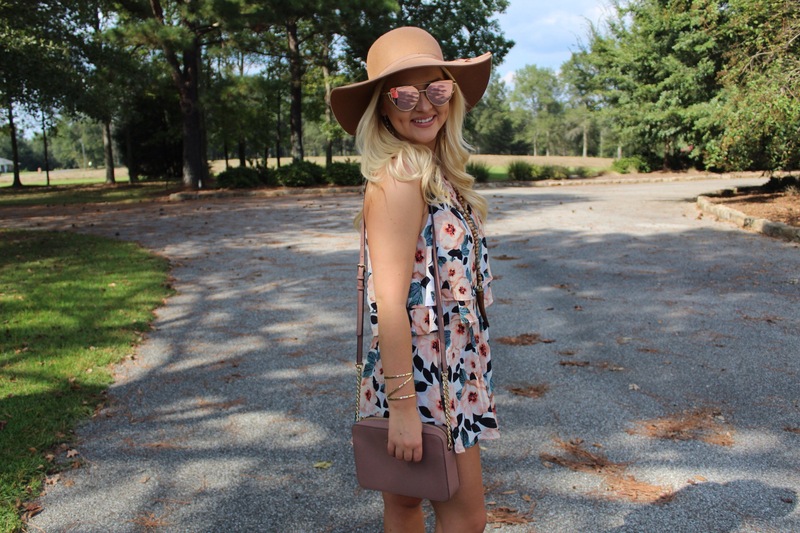 Show Me Your Mumu always does a great job of creating floral prints that you can wear now or later. I am wearing the “Steel Magnolia” print, which has sold out for the most part, BUT there is a new, fun print called “Duchess Darling” that I have linked below. 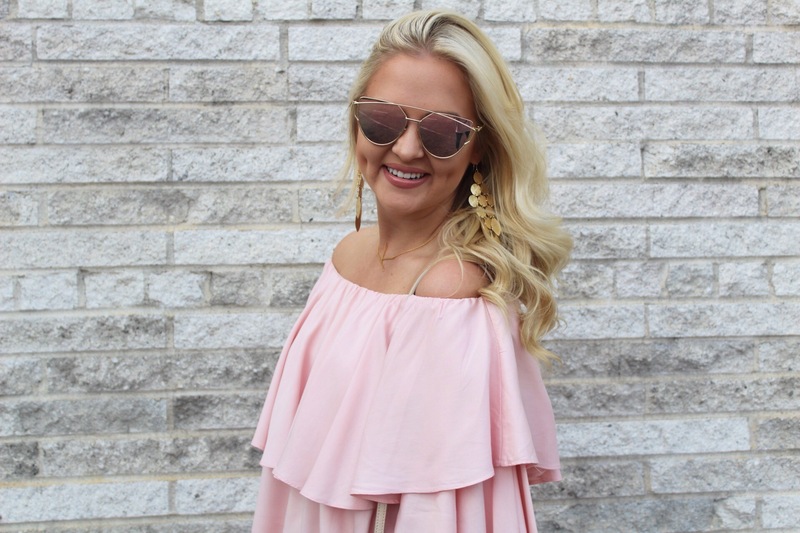 To me, two piece sets were also one of the biggest trends of the summer (and my absolute favorite), so I am not surprised that so many fall two pieces have started emerging. (I’m sure I’ll be posting one sooner or later haha) They are SO easy to wear without having to wonder if each piece really matches; obviously they do! I hope everyone has a fabulous rest of the week! Of course, my favorite transitional trend that I have been wearing nonstop is still lightweight sweaters and cutoff shorts. (See my similar post here from a few weeks ago!) 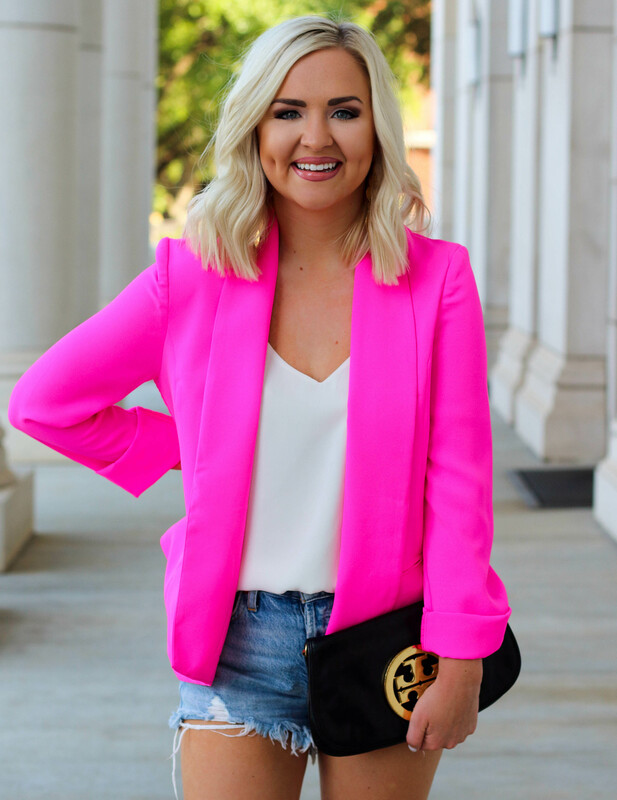 I love incorporating summer styles like shorts and fall favorites like sweaters to create a perfect outfit to handle Mississippi’s “fall weather” or lack thereof. I also think buying sweaters that are unusual colors for the cool weather end up standing out the most! To me, pastel shades like lavender, pale pink, and powder blue are always the prettiest sweaters and give such a sweet, feminine vibe. They are unexpected pieces and are sure to set you apart from all the neutral colors that start blending together after a while. Not that I don’t love a great taupe sweater, but it can be boring without cute accessories! I am all about bright colors (if y’all haven’t noticed haha) so styling this lavender Urban Outfitters sweater with turquoise accessories just felt right. The turquoise pops against the subtle lavender, so I am certain y’all will be seeing this color combination again very soon! My Free People cutoffs (best. shorts. ever.) and Steve Madden heels (I scored these on sale) complete the look! I linked my outfit and some other pastel sweaters I love in the carousel below. Thanks for reading! I never understood why fashion experts said you couldn’t wear white after Labor Day. Sure, white is definitely more of a summer color, but the fall style combinations for white clothing are pretty endless. I think there are limitations to breaking the rule, though! You probably do not want to be walking around wearing white shorts with white shoes in December, but white skinnies are do-able with a fall colored sweater, like burgundy or black, and cute booties. Or that white top you just bought in an end-of-summer sale? Throw a grey cardigan over it with classic denim skinnies unless you want to be trendy and pair with olive moto jeggings instead! White sweaters also look amazing with any color/style jean.. I am currently picturing the 70s wide leg jeans with a cream cowl neck sweater and a sleek pony tail! Unfortunately, it’s still too hot for any type of sweater, but a girl can dream right?! With Mississippi State football in full force, wearing white outfits on designated game days have been the perfect opportunity to add some burgundy (or maroon) details to make any look fall ready! I found this romper (the skort style is adorable) on one of my favorite online boutiques, but it was out of stock. After lots of searching, I finally figured out the brand (Moon River) and luckily, they sell retail merchandise from their website too! 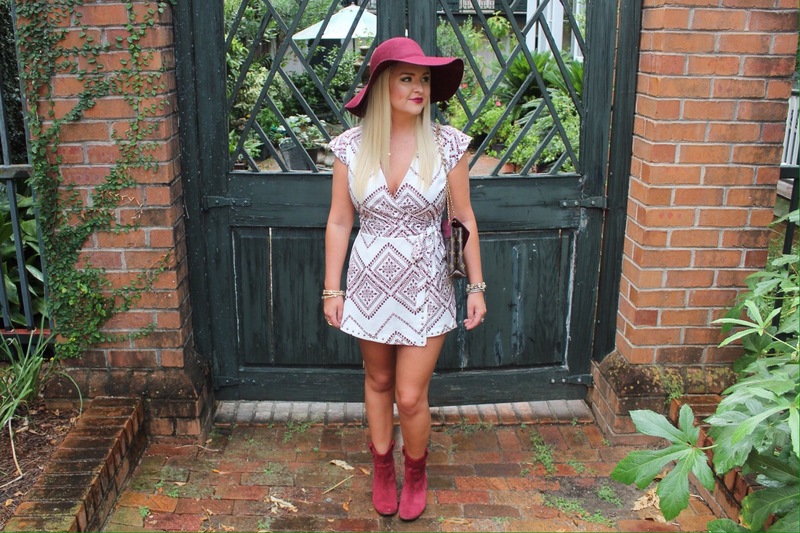 The abstract burgundy detailing makes the romper a solid transitional piece for fall even though it is white. 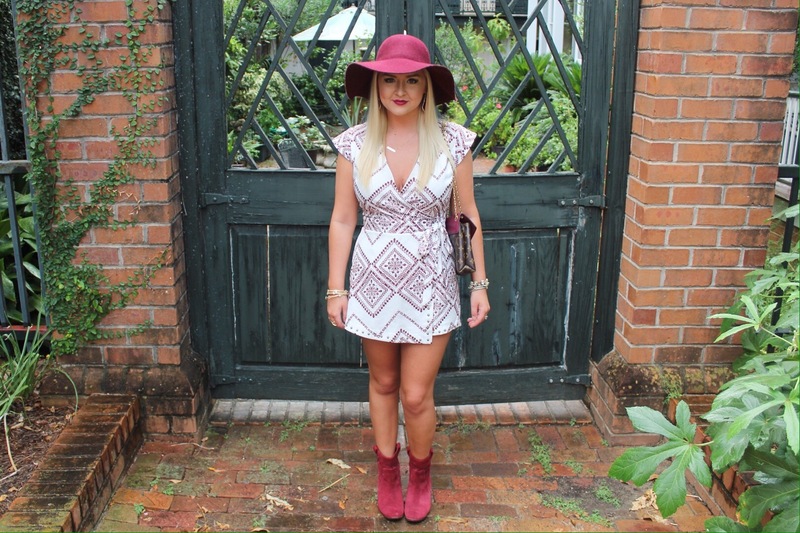 I added burgundy accessories like my hat and Kendra Scott earrings to make sure the outfit lost any summer vibe. My favorite Vince Camuto booties (from last year’s Nordstrom Anniversary Sale) also helped accomplish that. With the right pieces, wearing white can totally be acceptable to rock after Labor Day! If you are still not convinced, Emily Post actually approves of this reinvented fashion rule. And she’s the queen of proper etiquette! Shop my look plus a few of my favorite white pieces below.